An undergraduate student who conducted her research at the University of Georgia Skidaway Institute of Oceanography will attend a prestigious international science conference as a reward for winning the Outstanding Research Paper in the Savannah State University’s Bridge to Research program. Candilianne Serrano Zayas’ paper was chosen from 10 others and tied for first place. She will attend the international science conference sponsored by the Association for the Sciences of Limnology and Oceanography meeting in Granada, Spain, in February 2015. Zayas is a rising junior and biology major at the Universidad Metropolitana in San Juan, Puerto Rico. Her research project studied the microbiological community present in dolphins. 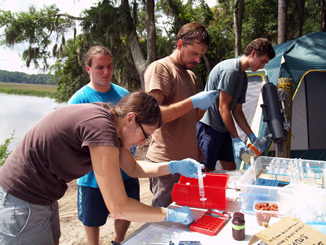 Zayas worked in the lab of Skidaway Institute professor Marc Frischer, who praised her and her mentors. “The combination of a good student, an appropriate project and, most importantly, a stellar mentor shoots these students to the stars,” Frischer said. Zayas was mentored by SSU graduate student Kevin McKenzie, who is also a member of the Frischer research team. Zayas echoed Frischer’s praise. “Kevin took the time to explain it all to me, even two or three times, and he taught me everything I did on this project,” she said. 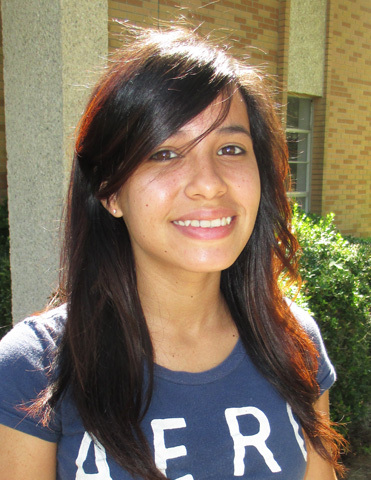 In the 2013, McKenzie mentored another REU student who also won this prestigious award. Kristopher Drummond, an SSU student and star football player for SSU, has continued the research he started and plans to continue his studies. Zayas says she plans to complete her bachelor’s degree in Puerto Rico and then attend graduate school. Zayas shared the first place honor with SSU student Darius Sanford, who worked at Gray’s Reef National Marine Sanctuary and who will also attend the ASLO meeting. Launched in 2009, the SSU Bridge to Research in Marine Sciences program is a National Science Foundation-funded Research Experience for Undergraduates program. The SSU program has proven successful in inspiring under-represented student populations to pursue degrees and careers in science and technology-based research fields. The seven-week 2014 Bridge to Research program began with field trips and classroom work covering research basics. The students then took a two-day research cruise on Skidaway Institute’s Research Vessel Savannah. They then were paired with a mentor at one of the participating organizations—Savannah State University, UGA Skidaway Institute of Oceanography, Gray’s Reef National Marine Sanctuary or Georgia Tech-Savannah. During this partnership, they conducted research and then presented it at a public forum. 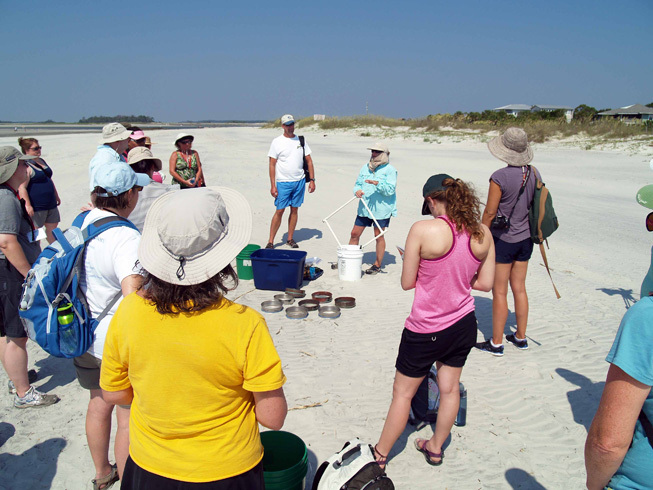 UGA Skidaway Institute of Oceanography’s Jay Brandes joined a group of K-12 teachers on an excursion to find microplastics in the beach sand on Tybee Island. 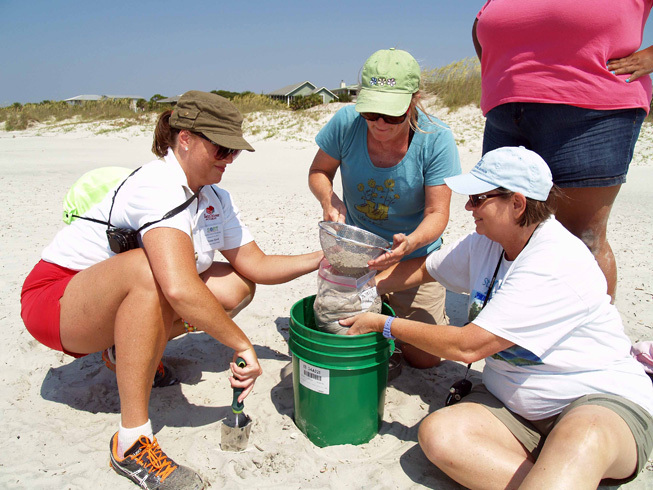 The teacher workshop was sponsored by the UGA Marine Extension Service and coordinated by Dodie Sanders. 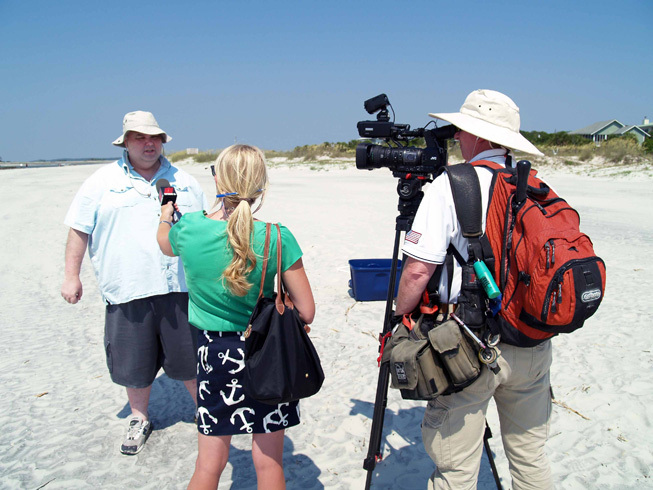 The trip on July 8 generated coverage from two local TV stations (WTOC-TV and WSAV-TV) and the Savannah Morning News. As of this morning, the newspaper article has not yet been published. Dodie Sanders (in the blue shirt) gives instructions to the teachers. Three teachers sift through the same looking for tiny particles of plastics. Dr. Jay Brandes is interviewed by WTOC-TV reporter Elizabeth Rawlins and photographer Channing Meacham.